Blob.lua is a small LuaJIT library for binary data parsing and serialization. Its intended use is to parse and generate arbitrary binary data, and to serialize Lua tables for efficient storage or transmission. I wrote this library mainly to implement a portable and compact file format for my font generator. You can use it to implement game saving and loading, for reading and writing all kinds of binary data formats or for efficient serialization of data over a network. It supports all basic types and nested tables, has dedicated functions to read and write native C signed/unsigned integer and floating point types, and handles both little and big endian data. I updated the library with pack/unpack functionality that works basically the same as string.pack/unpack in Lua 5.3 (with some differences). Instead of writing long chains of read*/write* instructions, you can now use a format string that describes the binary data format in a concise manner. The lib has been updated to version 2.0.1. The new version has a simplified and cleaner API. There is now a moonscript port available, which will eventually replace the Lua implementation. beef, float = reader\u32!, reader\f32! How is the performance of this in comparison to love.data.pack/unpack? and what are the benefits of using this over pack/unpack? I presume I could use this to serialize data to send over network... but is it more efficient than love.data.pack? When I created this lib, love.data.pack/unpack did not exist yet. It supports more data types than pack/unpack. BlowWriter/Reader can serialize tables and 64 bit integers, both trough dedicated read/write functions and the pack/unpack functions. LÖVE's pack/unpack can't handle tables or integers > 2^52. Pack/unpack is limited to the format string syntax, which can become tedious and a serious limitation, depending on your use case. This library can be used like file I/O, and provides read/write functions for each supported data type, while also having support for the pack/unpack syntax. BlobWriter uses an efficient storage scheme for strings and (optional) 32 bit integers. It has a special size-optimized 32 bits integer type (vs32/vu32) that is internally used to encode string lengths. Pack/unpack uses native data sizes, making it harder to use in cross-platform use cases, while Blob.lua uses fixed data sizes. It's much faster in general. In direct comparison, BlobWriter:pack is slower than love.data.pack. But you can of course combine love.data.pack with BlobWriter. Note that the comparison is flawed, because it does not take the cost of buffer concatenation into account that is already 'built-in' with BlobWriter:pack. Also, BlobWriter:pack does not support all features of love.data.pack. Nice! How does it compare to bitser https://github.com/gvx/bitser? I am using that along with a slight modification (https://github.com/expo/ghost-multi/com ... b6a1abe3ee) to handle entity references by id (to deserialize to existing entity on receiving end) for a multiplayer sync library (https://github.com/expo/ghost-multi/blo ... r/sync.lua) and am highly interested in fast + compact binary serialization. Nice! How does it compare to bitser https://github.com/gvx/bitser? I quickly made a test program to compare the speed of binser, bitser and Blob. Blob came out faster in almost all tests. Tests include: a sequence of 64k numbers (sequentialManyNumbers), 64k uint32_t (sequentialManyU32), 32 numbers (sequentialFewNumbers), 32 uint8_t (sequentialFewU8), and a deeply nested table (deepTable). 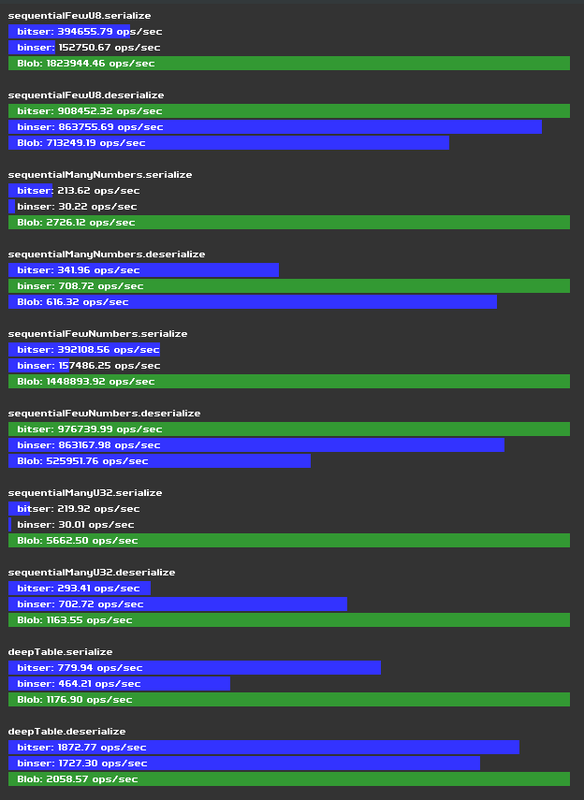 According to these results, serialization is pretty fast, but deserialization needs work. Take the results with a grain of salt though - these are not real life examples and I might even be using binser/bitser wrong. I am using that along with a slight modification (https://github.com/expo/ghost-multi/com ... b6a1abe3ee) to handle entity references by id (to deserialize to existing entity on receiving end) for a multiplayer sync library (https://github.com/expo/ghost-multi/blo ... r/sync.lua) and am highly interested in fast + compact binary serialization. Well, it's quite fast. Compactness depends on how you use it - if you know how many bits your values require and use it accordingly, it can be pretty much optimal with regards to data size. Just throwing tables at it won't do it. There's still room for optimzation though. Oh, and it doesn't have fancy class support like bitser. It supports simple values and nested tables, anything else will make it croak. Awesome! Will experiment with this myself. Thanks so much for the benchmark example! Will helps a lot. The README has read and write examples right at the top, and there's a (moonscript) file I/O example in the 'examples' directory. I just added a minimal example that shows how to read and write tables in LÖVE. Hope that helps. love.filesystem.read returns data and size; you can't pass the call result directly to BlobReader(), because it expects the optional second parameter to be byte order, not size. The save code is fine as is and should work as expected.